For other uses, see Traveler (disambiguation). Irish Travellers (Irish: an lucht siúil, meaning 'the walking people') are a traditionally itinerant ethnic group who maintain a set of traditions. Although predominantly English-speaking, many also use Shelta. They live mostly in Ireland as well as comprising large communities in the United Kingdom and the United States. Traveller rights groups have long pushed for ethnic status from the Irish government, finally succeeding in 2017. As of 2016, there are 30,987 Travellers within Ireland, and this has led to them becoming recognized as a minority group in Ireland. Travellers refer to themselves as Minkiers or Pavees, or in Irish as an Lucht Siúil ("the travelling people"). "Pikey" or "pikie" is a slang term, which is pejorative and considered by many to be a slur. It is used mainly in the UK and Ireland to refer to Travellers. In a pejorative sense it means "a lower-class person", perhaps 'coarse' or 'disreputable'. It is not well received among Irish Travellers or Romani, as it is considered an ethnic slur. Deeper documentation of Shelta and the Travellers dates to the 1830s, but knowledge of Irish Travellers has been seen from the 1100s, as well as the 1500s-1800s. Many decrees against begging in England were directed at Travellers, passed by King Edward VI around 1551. One such decree was the “Acte for tynckers and pedlers”. The identity of Irish Travellers resembles other itinerant communities, some aspects being self-employment, family networks, birth, marriage, and burial rituals, taboos and folklore. Because they worked with metal, Travellers had to travel throughout Ireland and work on making various items such as ornaments, jewellery and horse harnesses to make a living. As a result, by 1175, they were referred to as “tinkler,” “tynkere,” or Tinkers, as well as Gypsies, all of which are derogative names to refer to their itinerant way of life. Many different theories have been put forward to explain the origins of Ireland's itinerant population. A suggestion that they might be of Romani extraction is not supported by genetic evidence, which finds no connection to Romani groups. One idea is of them being distantly related to a Celtic group that invaded Ireland. Another theory is of a pre-Gaelic origin, where Travellers are descended from a community that lived in Ireland before the arrival of the Celts. Once Ireland was claimed as Celtic, this group was seen as lower class. There is also a theory that an indigenous, itinerant, community of craftsmen are the ancestors of Travellers, and they never settled down like the Celts. Other speculations on their origin are that they were descended from those Irish who were made homeless during the Cromwellian conquest of Ireland in the 1650s, or made homeless in either the 1741 or the 1840s famine due to eviction. :56:43 Genetic research has ruled these events out as the founding events for Travellers, however it cannot rule out the displacement of the population along with most of the Irish population during these events. It has since been recognised that no single explanation is likely to be adequate in answering this complex question. Current scholarship is investigating the background of Gaelic Ireland before the English Tudor conquest. The mobile nature and traditions of a Gaelic society based on pastoralism rather than land tenure before this event implies that Travellers represent descendants of the Gaelic social order marginalised during the change-over to an English landholding society. An early example of this mobile element in the population, and how displacement of clans can lead to increased nomadism within aristocratic warrior societies, is that of the Clan Murtough O' Connors, displaced after the Norman invasion. Present genetic evidence indicates that they are genetically Irish. In 2011, researchers at the Royal College of Surgeons in Dublin and the University of Edinburgh analyzed DNA samples from 40 Travellers. 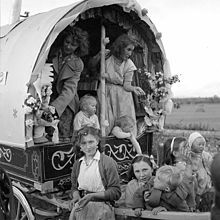 The study provided evidence that Irish Travellers are a distinct Irish ethnic minority, who have been distinct from the settled Irish community for at least 1000 years; the report claimed that they are as distinct from the settled community as Icelanders are from Norwegians. This apparent distance though may be the effect of genetic drift within a small homogeneous population and may therefore exaggerate the distance between the two populations. A genetic analysis of Irish Travellers found evidence to support: (1) Irish ancestry; (2) several distinct subpopulations; and (3) the distinctiveness of the midland counties due to Viking influence. In 2017 a further genetic study using profiles of 50 Irish Travellers, 143 European Roma, 2232 settled Irish, 2039 British and 6255 European or worldwide individuals confirmed ancestral origin within the general Irish population. An estimated time of divergence between the settled population and Travellers was set at a minimum of 8 generations ago, with generations at 30 years, hence 240 years and a maximum of 14 generations or 420 years ago. The best fit was estimated at 360 years ago, giving an approximate date in the 1650s. This date coincides well with the final destruction of Gaelic society following the 1641 Rebellion and during the Wars of the Three Kingdoms in which Cromwell's forces devastated the country. Irish Travellers are not an entirely homogeneous group instead reflecting some of the variation also seen in the settled population. Four distinct genetic clusters were identified in the 2017 study, and these match social groupings within the community. Genetic studies by Miriam Murphy, David Croke, and other researchers identified certain genetic diseases such as galactosemia that are more common in the Irish Traveller population, involving identifiable allelic mutations that are rarer among the rest of the community. suggesting descent from an original Irish carrier long ago with ancestors unrelated to the rest of the Irish population. They concluded that: "The fact that Q188R is the sole mutant allele among the Travellers as compared to the non-Traveller group may be the result of a founder effect in the isolation of a small group of the Irish population from their peers as founders of the Traveller sub-population. This would favour the second, endogenous, hypothesis of Traveller origins." More specifically, they found that Q188R was found in 100% of Traveller samples, and in 89% of other Irish samples, indicating that the Traveller group was typical of the larger Irish population. Irish Travellers speak English and sometimes one of two dialects of Shelta—Gammon (or Gamin) and Irish Traveller Cant. Shelta has been dated back to the 18th century but may be older. Cant, which derives from Irish, is a combination of English and Shelta. Shelta is a secret language. Irish Travellers do not like to share the language with outsiders, named “Buffers”, or non-Travellers. When speaking Shelta in front of Buffers, Travellers will disguise the structure so as to make it seem like they aren't speaking Shelta at all. There is fear that if outsiders know the entirety of the language, it will be used to bring further discrimination to the Traveller community. The Commission's 1963 report defined "itinerant" as "a person who had no fixed place of abode and habitually wandered from place to place, but excluding travelling show-people and travelling entertainers". It recommended assimilation of travellers by settling them in fixed dwellings, viewing the Netherlands' approach to its travelling minority as a model. This assimilation was to be achieved by the effective criminalisation of nomadism, and the report paved the way for an increasing state emphasis on criminal laws and penalties for trespass. 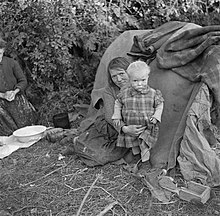 At the time, about 60% Irish travellers lived in barrel-roofed horse-drawn wagons, with almost 40% still using tents in summer (fewer in winter). The Travelling People Review Body (1981–83) advocated integration rather than assimilation, with provision for serviced halting sites. The Body's membership included travellers. The Task Force on the Travelling Community (1993–95) moved to an intercultural paradigm. The 2016 census in the Republic of Ireland reported the number of Irish Travellers as 30,987, up from 29,495 in 2011. In 2006 the number was 22,369. A further 1,700 to 2,000 were estimated to live in Northern Ireland. From the 2006 Irish census it was determined that 20,975 dwell in urban areas and 1,460 were living in rural areas. With an overall population of just 0.5% some areas were found to have a higher proportion, with high Traveller concentrations in Clare, Dublin, Galway and Limerick. There were found to be 9,301 Travellers in the 0–14 age range, comprising 41.5% of the Traveller population, and a further 3,406 of them were in the 15–24 age range, comprising 15.2%. Children of age range 0–17 comprised 48.7% of the Traveller population. Following the findings of the All Ireland Traveller Health Study (estimates for 2008), the figure for Northern Ireland was revised to 3,905 and that for the Republic to 36,224. In 2011, for the first time, the census category "Irish Traveller" was introduced as part of the broader Gypsy/Traveller section. The self reported figure for collective Gypsy/Traveller populations were 63,193 but estimates of Irish Travellers living in Great Britain range are about 15,000 as part of a total estimation of over 300,000 Romani and other Traveller groups in the UK. The London Boroughs of Harrow and Brent contain significant Irish Traveller populations. In addition to those on various official sites there are a number who are settled in local authority housing. These are mostly women who wish their children to have a chance at a good education. They and the children may or may not travel in the summer but remain in close contact with the wider Irish Traveller community. There are also a number of Irish Traveller communities in the Home Counties. An estimated 10,000 people in the United States are descendants of Travellers who left Ireland, mostly between 1845 and 1860 during the Great Famine. However, there are no official population figures regarding Irish Travellers in the United States as the US census does not recognise them as an ethnic group. While some sources estimate their population in the US to be 10,000, others suggest their population is 40,000. According to research published in 1992, Irish travellers in the US divide themselves up into groups that are based on historical residence: Ohio Travellers, Georgia Travellers, Texas Travellers, and Mississippi Travellers. The Georgia Travelers' camp is made up of about eight hundred families, the Mississippi Travelers, about three hundred families, and the Texas Travelers, under fifty families." Irish Travellers in the US are said to speak English and Shelta, a form of Cant. The Cant spoken in the US is similar to the Cant spoken in Ireland, but differs in some respects in that the language has transformed into a type of pidgin English over the generations. They typically work in asphalting, spray-painting, laying linoleum, or as itinerant workers to earn their living. Travellers have a distinctive approach to religion; the vast majority are practising Roman Catholics with particular attention paid to issues of healing. They have been known to follow a strict code of behaviour that dictates some of their moral beliefs and influences their actions. Traveller children often grow up outside educational systems. The Irish Traveller Movement, a community advocacy group, promotes equal access to education for Traveller children. In December 2010, the Irish Equality Tribunal ruled in favour of a traveller child in an anti-discrimination suit covering the admission practices of CBS High School Clonmel in County Tipperary. In July 2011, the secondary school in Clonmel successfully appealed the decision of the Equality Tribunal that its admission criteria were indirectly discriminatory against children from the Traveller community. From birth to old age, they have high mortality rates, particularly from accidents, metabolic and congenital problems, but also from other major causes of death. Female Travellers have especially high mortality compared to settled women. In 2007, the Department of Health and Children in the Republic of Ireland, in conjunction with the Department of Health, Social Services and Public Safety in Northern Ireland, commissioned the University College Dublin's School of Public Health and Population Science to conduct a major cross-border study of Travellers' welfare. The study, including a detailed census of Traveller population and an examination of their health status, was expected to take up to three years to complete. The main results of the study were published in 2010. The birth rate of Irish Travellers has decreased since the 1990s, but they still have one of the highest birth rates in Europe. The birth rate for the Traveller community for the year 2005 was 33.32 per 1,000, possibly the highest birth rate recorded for any community in Europe. On average there are ten times more driving fatalities within the Traveller community. At 22%, this represents the most common cause of death among Traveller males. Some 10% of Traveller children die before their second birthday, compared to just 1% of the general population. In Ireland, 2.6% of all deaths in the total population were for people aged under 25, versus 32% for the Travellers. In addition, 80% of Travellers die before the age of 65. According to the National Traveller Suicide Awareness Project, Traveller men are over six times more likely to kill themselves than the general population. According to Christopher Griffin, arranged Irish Traveller marriages in the early 21st century "safeguard the girl's [interests] by securing a man who won't mistreat her. "(p247) According to Julie Bindel, in Standpoint, some Irish Traveller females in the UK are forced into marriages, but Bindel points out that data is difficult to obtain because "the line between an arranged marriage and a forced one is not always clear." Travellers are often reported as the subject of explicit political and cultural discrimination, with politicians being elected on promises to block Traveller housing in local communities and individuals frequently refused service in pubs, shops and hotels. A 2011 survey by the Economic and Social Research Institute of Ireland concluded that there is widespread ostracism of Travellers in Ireland, and the report concluded that it could hurt the long-term prospects for Travellers, who "need the intercultural solidarity of their neighbours in the settled community. ... They are too small a minority, i.e., 0.5 percent, to survive in a meaningful manner without ongoing and supportive personal contact with their fellow citizens in the settled community." The general prejudice against Travellers hinders efforts by the central government to integrate Travellers into Irish society. Because Travellers are a minority group within Ireland and the United Kingdom, they have always faced discrimination on the basis of their ethnicity as Travellers. They experience discrimination in not having equal access to education, being denied service in pubs, shops, and hotels, and being subject to derogatory language. In 2016, the USA's Country Reports on Human Rights Practices for the United Kingdom stated that Irish Travellers (among other groups) widely reported discrimination in the country, and highlighted that the High Court had ruled the government had illegally discriminated against Travellers by unlawfully subjecting planning applications to special scrutiny. Travellers are often referred to by the terms tinkers, gipsies/gypsies, itinerants, or, pejoratively, knackers in Ireland. Some of these terms refer to services that were traditionally provided by the group: tinkering or tinsmithing, for example, being the mending of tinware such as pots and pans, and knackering being the acquisition of dead or old horses for slaughter. The term gypsy first appears in records dating back to the 16th century when it was originally used to refer to the continental Romani people in England and Scotland, who were mistakenly thought to be Egyptian. (p158) Other derogatory names for itinerant groups have been used to refer to Travellers including the word pikey. Many Travellers are breeders of dogs such as greyhounds or lurchers and have a long-standing interest in horse trading. The main fairs associated with them are held annually at Ballinasloe (County Galway), Puck Fair (County Kerry), Ballabuidhe Horse Fair (County Cork), the twice yearly Smithfield Horse Fair (Dublin inner city) and Appleby (England). They are often involved in dealing scrap metals, e.g., 60% of the raw material for Irish steel is sourced from scrap metal, approximately 50% (75,000 metric tonnes) segregated by the community at a value of more than £1.5 million. Such percentages for more valuable non-ferrous metals may be significantly greater. Irish Travellers are recognised in British and Irish law as an ethnic group. An ethnic group is defined as one whose members identify with each other, usually on the basis of a presumed common genealogy or ancestry. Ethnic identity is also marked by the recognition from others of a group's distinctiveness and by common cultural, linguistic, religious, behavioural or biological traits. In 2008 a faction fight riot broke out in D'Alton Park, Mullingar involving up to 65 people of the Nevin, Dinnegan and McDonagh families. The court hearing in 2010 resulted in suspended sentences for all the defendants. The cause may have been an unpaid gambling debt linked to a bare-knuckle boxing match. A 2011 report, conducted by the Irish Chaplaincy in Britain, Voices Unheard: A Study of Irish Travellers in Prison (Mac Gabhann, 2011) found that social, economic and educational exclusion were contributing factors to the "increasingly high levels of imprisonment" of Irish Travellers. In 2016, Irish Travelers from the southern East Coast of the United States plead guilty to charges of perpetrated scams on homeowners and government agencies. By 2017, 52 had plead guilty to violations of the federal Racketeer Influenced and Corrupt Organizations Act (RICO). A common complaint against Travellers in the United Kingdom is that of unauthorised Traveller sites being established on privately owned land or on council-owned land not designated for that purpose. Under the government's "Gypsy and Traveller Sites Grant", designated sites for Travellers' use are provided by councils, and funds are made available to local authorities for the construction of new sites and maintenance and extension of existing sites. However, Travellers make frequent use of other, non-authorised sites. These include public "common land" and private plots such as large fields and other privately owned land. A famous example was Dale Farm in Essex. The Travellers claim that there is an under-provision of authorised sites. The Gypsy Council estimates an under-provision amounts to insufficient sites for 3,500 people. The passing of the Caravan Sites Act 1968, for some time, safeguarded their right to a site, but the Criminal Justice and Public Order Act 1994 repealed part II of the 1968 act, removing the duty on local authorities in the UK to provide sites for Travellers and giving them the power to close down existing sites. In Northern Ireland, opposition to Travellers' sites has been led by the Democratic Unionist Party. Irish Travellers have been depicted, usually negatively but sometimes with some care and sympathy, in film, radio, print, and television. Shows like The Riches (2007–2008), the American television series featuring Eddie Izzard and Minnie Driver, take a deeper look into the Traveller lifestyle. The documentary series Big Fat Gypsy Weddings (2010, 2011, and 2012) has been commercially successful in the United Kingdom, offering glimpses of Traveller life as viewed at real-life weddings. A 1997 American film, Traveller, starring Bill Paxton and Mark Wahlberg, also explored the Travellers in America. ^ A 1986 study reported that 39% of marriages in the study were between first cousins. (p110) According to Alison Healy in 2003, 19–40% of Irish Traveller marriages are between first cousins. ^ a b 6. Ethnicity and Irish Travellers (PDF) (Report). Central Statistics Office. 2017. p. 3. Archived (PDF) from the original on 14 April 2017. Retrieved 5 February 2018. ^ "Questioning Gypsy". paveepoint.ie. Archived from the original on 1 October 2011. ^ "Taoiseach formally recognises ethnic status". The Independent. 1 March 2017. ^ Rieder, Maria (2018). "Irish Travellers' view on Cant: what folk criteria of languageness tell us about the community". Language Awareness. 27: 41. ^ Clarity, James F. (8 February 1999). "Tullamore Journal; Travelers' Tale: Irish Nomads Make Little Headway". The New York Times. ^ "How Offensive is the Word Pikey?". BBC NEWS. 11 June 2008. Retrieved 12 November 2012. ^ Kenrick, Donald (2010). The A to Z of the Gypsies (Romanies). Scarecrow Press. p. 128. ISBN 9781461672272. ^ Ó Riain, Seán (2000). Solidarity with Travellers: a story of settled people making a stand for Travellers. Dublin: Roadside Books. ISBN 978-0-9539384-0-7. ^ Helleiner, Jane (2003). Irish Travellers: Racism and the Politics of Culture. University of Toronto Press. ISBN 978-0-8020-8628-0. ^ Gmelch, Sharon (1975). Tinkers and Travellers. Dublin: The O'Brien Press. p. 10. ISBN 0 905140 69 9. ^ Rieder, Maria (2018). "Irish Travellers' views on Cant: what folk criteria of languageness tell us about the community". Language Awareness. 27: 41. ^ Griffin, Rosarii (2014). Education in Indigenous, Nomadic and Travelling Communities. A&C Black. p. 50. ISBN 9781472511195. ^ a b Keane, David (2005). "International law and the ethnicity of Irish Travellers". Washington and Lee Journal of Civil Rights and Social Justice. 11 (1). ISSN 1942-5732. ^ Ní Shúinéar, Sinéad (1994). Irish Travellers, Culture and Ethnicity. Belfast: W & G Baird Ltd. pp. 70–72. ISBN 0 85389 493 0. ^ Helleiner, Jane (May 2003). Irish Travellers: Racism and the Politics of Culture. ISBN 9780802086280. ^ Simms, Katharine (2001). "A Lost Tribe: The Clan Murtagh O'Conors". Journal of the Galway Archaeological and Historical Society. 53: 1–22. JSTOR 25535718. ^ a b North, Kari E.; Martin, Lisa J.; Crawford, Michael H. (September – October 2000). "The origins of the Irish travellers and the genetic structure of Ireland". Annals of Human Biology. 27 (5): 453–465. doi:10.1080/030144600419297. ISSN 1464-5033. PMID 11023116. ^ Hough, Jennifer (31 May 2011). "DNA study: Travellers a distinct ethnicity". irishexaminer.com. Blackpool, IE: Irish Examiner. Retrieved 17 May 2016. separated from the settled community between 1,000 and 2,000 years ago. ^ "Travellers as 'genetically different' from settled Irish as Spanish". ^ Gmelch, Sharon (1991) [©1986]. "Preface". Nan: the life of an Irish Travelling woman (Biography) (Reissue with changes ed.). Long Grove, IL: Waveland Press. pp. 11–14. ISBN 978-0-88133-602-3. ^ Murphy, Miriam; McHugh, Brian; Tighe, Orna; Mayne, Philip; O'Neill, Charles; Naughten, Eileen; Croke, David T. (July 1999). "Genetic basis of transferase-deficient galactosaemia in Ireland and the population history of the Irish Travellers" (PDF). European Journal of Human Genetics. 7 (5): 549–554. doi:10.1038/sj.ejhg.5200327. ISSN 1476-5438. PMID 10439960. ^ a b c d Andereck, Mary E. (1996). "Irish Travelers". In O'Leary, Timothy J.; et al. (eds.). Encyclopedia of world cultures. 1. New York: Macmillan Reference USA. pp. 162–164. Archived from the original on 14 January 2015. Retrieved 21 December 2011 – via encyclopedia.com. ^ Liégeois, Jean-Pierre (2007). Roma in Europe (in English and French). Strasbourg: Council of Europe Publishing. p. 43. ISBN 978-92-871-6051-5. ^ Meyer, Kuno (January 1909). "The secret languages of Ireland". Journal of the Gypsy Lore Society, New Series. 2 (3): 241–246. hdl:2027/inu.30000105045102. ISSN 0017-6087. ^ Binchy, Alice (1994). Irish Travellers: Culture and Ethnicity. Belfast: W & G Baird Ltd. p. 134. ISBN 0 85389 493 0. ^ a b Ruckstuhl, Ina (23 February 2015). "The making of the Irish Traveller Community: Mobility discourse, settlement policies and the Irish state 1950-2010". Imi Working Paper Series. 109. ^ Commission on Itinerancy 1963, p. 11. ^ Commission on Itinerancy 1963, p. 12. ^ Commission on Itinerancy 1963, pp. 28, 106. ^ Commission on Itinerancy 1963, p. 40. ^ a b c O'Connell, John (October 1997). "Policy Issues in Ireland". In Orla Egan (ed.). Minority Ethnic Groups In Higher Education In Ireland - Proceedings of Conference held in St. Patrick's College, Maynooth, 27 September 1996. Higher Education Equality Unit. ISBN 978-1-85918-159-1. ^ Travelling people review body (February 1983). Report (PDF). Official publications. Pl.1520. Dublin: Stationery Office. ^ Task Force on the Travelling Community (July 1995). Report (PDF). Official publications. Pn.1726. Dublin: Department of Equality and Law Reform. ^ Redmond, Andrea (2008). "'Out of Site, Out of Mind': An Historical Overview of Accommodating Irish Travellers' Nomadic Culture in Northern Ireland" (PDF). Community Relations Council (CRC). pp. 1, 71. Archived from the original (PDF) on 18 July 2011. Retrieved 11 June 2010. ^ a b Abdalla, Safa; et al. (September 2010). Kelleher, Cecily (ed.). Demography & Vital Statistics Part A of Technical Report 2 (PDF). All Ireland Traveller health study. Dublin: School of Public Health, Physiotherapy and Population Science, University College Dublin. p. 20. Archived from the original (PDF) on 17 March 2012. Retrieved 28 March 2011. ^ "2011 Census: Ethnic group1, local authorities in the United Kingdom" (XLS). Ons.gov.uk. Retrieved 2 August 2017. ^ "Traveller Health: A National Strategy 2002–2005". Irish Medical Journal. Archived from the original on 3 December 2012. ^ Bindel, Julie (25 February 2011). "The big fat truth about Gypsy life". The Guardian. London. ^ Lloyd, Gwynedd (2008). "Education and Gypsies/Travellers: contradictions and significant silences". International Journal of Inclusive Education. 12:4 (4): 331–345. doi:10.1080/13603110601183065. ^ Sedghi, Ami (29 June 2011). "Every Gypsy and Traveller caravan site in England mapped and listed". The Guardian. London. ^ a b c Mary E. Andereck (21 February 1992). Ethnic Awareness and the School: An Ethnographic Study. SAGE Publications. pp. 22–. ISBN 978-0-8039-3886-1. ^ "Who are the Irish Travellers in the United States?". Pavee Point Travellers Centre. June 2005. Archived from the original on 1 October 2011. Retrieved 20 July 2011. ^ DEEGAN, DENISE (28 May 2011). "Trapped by the Traveller code?". The Irish Times. Archived from the original on 12 June 2011. Retrieved 12 June 2011. ^ "ITM Key Issues – Education". Irish Traveller Movement. Archived from the original on 12 June 2011. Retrieved 12 June 2011. ^ Coulter, Carol (10 December 2010). "Traveller wins discrimination case over school's 'father rule'". The Irish Times. Archived from the original on 12 June 2011. Retrieved 12 June 2011. ^ "School wins appeal over exclusion of Traveller". Journal.ie. 25 June 2011. ^ "50% of Travellers die before 39 - study". The Irish Times. 25 June 2007. ^ "Minister Harney Launches All-Ireland Traveller Health Study". UCD. 10 July 2007. Retrieved 15 June 2009. ^ "All Ireland Traveller Health Study". UCD. September 2010. Retrieved 11 November 2015. ^ "All Ireland Traveller Health Survey" (PDF). National Traveller Suicide Awareness Project. September 2010. ^ a b c McElwee, Niall C.; Jackson, Ashling; Charles, Grant (2003). "Towards a sociological understanding of Irish Travellers: introducing a people". Irish Journal of Applied Social Studies. 4 (1). ISSN 1393-7022. ^ a b c Okely, Judith (1983). The traveller-gypsies. Cambridge [u.a. ]: Cambridge University Press. pp. 153, 158. ISBN 978-0-521-24641-5. ^ "Press Release Census 2011 Profile 7 Religion, Ethnicity and Irish Travellers" (Press release). Dublin: Central Statistics Office. 18 October 2012. Archived from the original on 17 October 2013. Retrieved 30 March 2016. ^ a b Government of Ireland. Department of the Environment (July 1995). Report of the task force on the Travelling Community. Dublin: Department of the Environment. pp. 140, 156, 264, 275 276. hdl:10147/560365. ^ Healy, Alison (1 May 2003). "Study urges genetic counselling for cousins who marry". Irishtimes.com. Dublin. ^ a b c Griffin, Christopher (2008). Nomads under the Westway: Irish travellers, Gypsies and other traders in West London. Hatfield: University of Hertfordshire Press. pp. 246 247. ISBN 978-1-902806-54-9. ^ Bindel, Julie (January – February 2012). "Forced marriages dishonour Britain". Standpoint. ISSN 1757-1111. Archived from the original on 4 January 2012. ^ DALBY, DOUGLAS (29 October 2015). "Sympathy Is Short-Lived for Irish Minority Group After Deadly Fire". The New York Times. Retrieved 30 October 2015. ^ Holland, Kitty (18 May 2011). "Young among the most prejudiced, expert finds". Irish Times. Retrieved 18 May 2011. ^ Douglas Dalby (29 October 2015). "Sympathy Is Short-Lived for Irish Minority Group After Deadly Fire". The New York Times. Retrieved 30 October 2015. Such is the animus toward Travelers that almost half of the country's 31 localities returned the money allocated by the central government for Traveler accommodations this year. ^ "Country Reports on Human Rights Practices for 2016". State.gov. Retrieved 2 August 2017. ^ "The Roma Empire". newsquest (sunday herald). 2009. Archived from the original on 28 January 2017. Retrieved 11 May 2009. ^ Geoghegan, Tom (11 June 2008). "How offensive is the word 'pikey'?". BBC News Magazine. Retrieved 11 May 2009. ^ "2002 Census Of Population Volume 8 - Irish Traveller Community - CSO - Central Statistics Office". Cso.ie. Retrieved 2 August 2017. ^ Barry, Aoife. "First 'new-look' regulated Smithfield Horse Fair on Sunday". Thejournal.ie. Retrieved 2 August 2017. ^ "Gypsies and Irish Travellers: The facts". cre.gov.uk. Archived from the original on 3 February 2007. ^ Hickey, Shane; Cunningham, Grainne (5 May 2009). "Garda injured after riot squad called to Traveller pub battle". Irish Independent. ^ Bhreatnach, Aoife (2006). Becoming conspicuous: Irish travellers, society and the state, 1922–70. University College Dublin Press. p. 108. ISBN 978-1-904558-61-3. ^ Travellers owe it to Mullingar to sort out their grievances Westmeath Examiner. 5 August 2008. ^ Dalton Park rioters given suspended sentences Westmeath Examiner. 24 February 2010. ^ "Riot families spurned peace bid". Irish Independent. 31 July 2008. ^ Mac Gabhann. "Voices Unheard: Irish Travellers in Prison". Irish Chaplaincy in Britain. Archived from the original on 1 September 2013. ^ Monk, John (22 August 2017). "25 more SC Irish Travelers plan to plead guilty to fraud charges". The State. Retrieved 16 September 2018. ^ "BBC NEWS - UK - Councils 'must find Gypsy sites'". bbc.co.uk. 27 January 2005. ^ Irish Traveller Movement - Unless otherwise noted. "ITM View Key Issue". itmtrav.ie. Archived from the original on 17 October 2013. ^ "Racism in Ireland: Travellers Fighting Back" (PDF). Red and Black Revolution (2): 23. 1996. Retrieved 12 August 2013. ^ "Pavee Point 'About us'". Retrieved 16 November 2016. ^ "TVG cork Site". Retrieved 20 August 2017. Commission on Itinerancy (26 November 1963). Report (PDF). Official publications. Pr.7272. Dublin: Stationery Office. Archived (PDF) from the original on 4 September 2015. Bhreatnach, Aoife (2007). Becoming Conspicuous: Irish Travellers, Society and the State 1922–70. Dublin: University College Dublin Press. ISBN 978-1-904558-62-0. Bhreatnach, Ciara; Bhreatnach, Aoife, eds. (2006). Portraying Irish Travellers: histories and representations. Newcastle-upon-Tyne: Cambridge Scholars Press. ISBN 978-1-84718-055-1. Burke, Mary (2009). 'Tinkers': Synge and the Cultural History of the Irish Traveller. Oxford University Press, USA. ISBN 978-0-19-956646-4. Dillon, Eamon (2006). The outsiders: exposing the secretive world of Ireland's Travellers. Merlin Publishing. ISBN 978-1-903582-67-1. Drummond, Anthony (2006). "Cultural denigration: media representation of Irish Travellers as criminal". In Hayes, Micheál; Acton, Thomas (eds.). Counter-Hegemony and the Postcolonial "Other". Cambridge Scholars Press: Cambridge. pp. 75–85. ISBN 978-1-84718-047-6. Drummond, Anthony (2007). "The construction of Irish Travellers (and gypsies) as a 'problem' ". In Ồ hAodha, Micheál (ed.). Migrants and Memory: The Forgotten "Postcolonials". Cambridge: Cambridge Scholars Press. pp. 2–42. ISBN 978-1-84718-344-6. Drummond, Anthony (2007). Irish Travellers and the Criminal Justice Systems Across the Island of Ireland (Ph.D. thesis). University of Ulster. Gmelch, George (1985). The Irish Tinkers: the urbanization of an itinerant people. Prospect Heights, Illinois: Waveland Press. ISBN 978-0-88133-158-5. Gmelch, Sharon (1991). Nan: The Life of an Irish Travelling Woman. Prospect Heights, Illinois: Waveland Press. ISBN 978-0-88133-602-3. García Grande, María Remedios (2010). Ni una palabra más (in Spanish). Bilbao Biografías Personales. ISBN 978-84-614-1053-8. Joyce, Nan (1985). Farmar, Anna (ed.). Traveller: an autobiography. Dublin: Gill and Macmillan. ISBN 978-0-7171-1388-0. Maher, Sean (1998). The Road to God Knows Where: A Memoir of a Travelling Boyhood. Dublin: Veritas Publications. ISBN 978-1-85390-314-4. Merrigan, Michael (2009). "Is there a Case for Indigenous Ethnic Status in Ireland". In Stanley, Rory J. (ed.). Féil-scríbhinn Liam Mhic Alasdair: essays presented to Liam Mac Alasdair, FGSI. Dublin: Genealogical Society of Ireland. pp. 101–115. ISBN 978-1-898471-67-7. Ó hAodha, Micheál; Acton, Thomas A., eds. (2007). Travellers, Gypsies, Roma: The Demonisation of Difference. Newcastle-upon-Tyne: Cambridge Scholars Press. ISBN 978-1-84718-127-5. Relethford, John H.; Crawford, Michael H. (2013). "Genetic drift and the population history of the Irish travellers". American Journal of Physical Anthropology. 150 (2): 184–189. doi:10.1002/ajpa.22191. ISSN 0002-9483. PMID 23180293. Sánchez Rodríguez, Eleuterio (1977). Camina o revienta: memorias de "El Lute" (in Spanish). Madrid: Cuadernos para el diálogo. ISBN 978-84-229-6014-0. Thouroude, Guillaume (2012). Voyage au pays des Travellers: Irlande, début du XXIe siècle. Voyage au pays des ... (in French). Paris: Cartouche. ISBN 978-2-915842-84-5. .
Wikimedia Commons has media related to Irish Travellers.